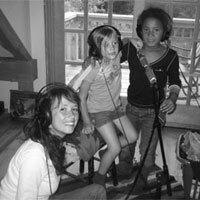 About The Artist: Gifted singer-songwriter Sarah Lee Guthrie brings charm, freshness, and feeling to her debut recording of music for children and families. Joined by her husband Johnny Irion, their two young daughters, and a host of other family and friends including Arlo Guthrie, Pete Seeger, and Tao Rodriguez Seeger, Guthrie presents thoughtful yet playful recordings of traditional songs and new compositions. The album includes three songs featuring lyrics by Woody Guthrie never before put to music and eight songs written by Sarah Lee and family. Go Waggaloo continues the Guthrie song-making tradition forged by Sarah’s grandfather, Woody Guthrie.